Today was an emotional day for many of my friends. The day after Election Day is often wrought with emotion of some sort: elation, disappointment, joy, despair. No matter where you fall along the political spectrum, I’m sure you’ve experienced some form of emotion from this year’s election. Don’t you just wish you could be a kid again and not have to worry about all this “stuff”? Well, that’s the inspiration for today’s Random Act of Kindness. To be a kid again. To recapture the simple joys in life. To be delighted in the unexpected and to simply live in the moment. Ladies and gentleman, may I bring your attention to… the power of pennies. Yes, pennies! As an adult, pennies have little value in our lives. In fact, I will be the first to admit that I will avoid carrying around pennies at all costs. They have absolutely no value to me! But to a child a penny can be magical. All you need is a fancy wishing fountain and all of a sudden your penny can do wonderous things! So today, my daughter and I brought some joy back into the world. Visiting a nearby mall that has a fountain, we secretly scattered pennies all around, to be discovered and used by anyone who might need an extra wish or two. We placed them in plain sight, where we knew others would see them: Around the fountain, on the ground, even on the benches nearby. Maybe it’s the Pollyanna spirit in me to find the positive in all things, but I thought it was something simple I could to do brighten someone else’s day. 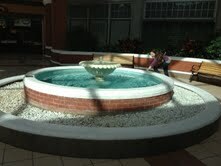 Wouldn’t you like to toss a penny in a fountain and have your wish come true? Kindness. Generosity. Joy. These are the characteristics I am focusing on today. While you and I might disagree on our political perspectives, can I still find a way to be kind to you? Absolutely! Because at the end of the day, I’m here. You’re here. We might as well find some joy in our day, learn how to get along, and simply rock on!